It was to our good fortune that Gottfried Helnwein also strove to break away from the museum and gallery sector in order to communicate with a larger public. This appeared on a grand scale on the site between the cathedral and Museum Ludwig, and at a time of "photokina", with its hundreds of thousands of visitors. The 100 metre picture wall did not fail to hit its mark: it induced bewilderment as well as aggressiveness. After a few days numerous pictures had been slashed, one even stolen. Gottfried Helnwein saw the exhibition as a process which would continue and be reflected in later presentations. The pictures were not renewed, but patched up, so that this reminder of the persecution of Jewish people would bear the traces of a lack of insight and understanding in the present day. There is not a more destructive judgement on one's fellow human beings than to declare his existence superfluous and possibly even damaging. Man has developed numerous variations of this attitude. The most harmless form is the snobby arrogance whereby one's fellow men are treated as pitiful worms, as quantité négligeable. A more dangerous one is that of the self-centred whereby one's fellow human beings are usually ignored or at best viewed as a nuisance. A fatal one is the ignorance which makes it possible to simply not acknowledge the misery of whole nations, be it due to convenience, be it due to negligence. Finally, there is the possibility to institutionalize attitudes of this nature and to legitimize them by law, which led to the establishment of societal hierarchies in the national or international structure of peoples. In such cases a ratification of this type is mostly scientifically anchored and substantiated. The National Socialists had combined all these elements in a particularly perfidious way and developed a system from a mixture of arrogance, racial theory, dictatorship and military might which allowed them to define "life not worth living", to discriminate against, and eventually to annihilate, millions of people. Since the turn of the century science had described and evaluated racial characteristics with the help of a profusion of pseudoscientific literature. "Reichskristallnacht" was the signal, and on November 9, 1938, all that had been developed by scientists and made legitimate by politicians was put into effect. 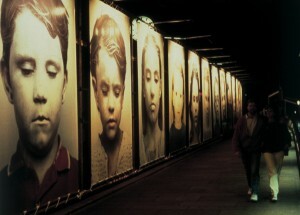 The hundred metre "picture wall", which was developed and constructed by Gottfried Helnwein on the occasion of the "photokina '88" and erected between Museum Ludwig and the Cologne Cathedral along platform 1 of the main station, serves to remind us of this occurrence - the mass murder of six million Jewish, Romany, Sinti and other peoples. Childrens' faces are to be seen on seventeen pictures, each one measuring 4x2 metres, finished using the scannachrome process. Next to these, in small format, a black and white table showing the differences between the Aryan and the inferior races by way of their posture when seated and foot prints - obviously in the framework of scientific treatment. What we see are average faces, identical to hundreds of others that we could meet on the street: children between the ages of six and seven, whose faces are slightly toned white with make-up. Indeed their facial expressions are passive in a way which is difficult to describe: sometimes the eyes are half closed, sometimes the head is photographed slightly from below or just off centre. The portraits are irritating, since the children are portrayed in a way in which children generally would not be photographed. There is no good cheer, no childlike innocence, no sparkle in the eyes. We imagine pictures of children to be different. It is the subtle alterations in the facial expression and posture that cause us to be disturbed by these images. As soon as one rids oneself of the emotional impression and attempts to sober appraisal, it becomes obvious that these are wholly normal, thoroughly average childrens' faces. It is exactly this effect which Gottfried Helnwein aimed to achieve in his work. He wanted to shock, but at the same time he also wanted to make it clear that there is really no reason for such shock, that all that we see is completely normal. In this manner he achieves an impact which is principally comparable to the effect of National Socialist propaganda. Even the Jews were, when considered lucidly, and if one cast aside the image created by the National Socialist campaign, ordinary people like you and I, neighbours whom one had known for many years, the doctor who had treated the children or the shopkeeper living opposite. Those people had not changed, only their public image.The study of this paragraph in our history brings clearly to light that it is enough merely to alter the way an image appears to the public in order to achieve the reevaluation of a system of values handed down through generations. Something similar is induced by Gottfried Helnwein's portraits, which cause the sight of completely normal children to be shocking and make their faces appear ill and strange. Gottfried Helnwein, famous in the art world as painter and politically committed performer, familiar to a wide audience due to provocative front page features in magazines, complimented his work in art with photography from the outset. What had then begun as a documentation of his actions was granted autonomy through the years as he became conscious of how many effective possibilities photography possessed, possibilities which remain outside the realm of painting and drawing. Whilst it is essential to the painting - especially those which tend to hyper-realism - that it is a product of the imaginary force and fantasy of the artist, every photographic project, however much it has been manipulated, bears a remainder of the authentic force of its daily uses for documentation in both the private and public sectors. If Gottfried Helnwein has to make use of a photographic accurateness in his painting, so as to make his fiction and fantasy as real as possible (and consequently believable), it would suffice to occasionally use inconspicuous changes and simple superimposition in order to smelt two realities into one to fuse that which is divided by space or by means of montage without the force of authenticity (which is a quality of photographic pictures as a medium), suffering any damage. it induced bewilderment as well as aggressiveness. After a few days numerous pictures had been slashed, one even stolen. Gottfried Helnwein saw the exhibition as a process which would continue and be reflected in later presentations. The pictures were not renewed, but patched up, so that this reminder of the persecution of Jewish people would bear the traces of a lack of insight and understanding in the present day. The appearance of the picture wall arouses feelings as though much more than a picture has been injured by these stabs and slashes. It will be interesting to see how public reactions in Switzerland and America differ from those in Cologne. The exhibition site will, however, certainly play a role. A purely musing ambience is conductive to a willingness to tolerate, whereas in Cologne the immediate vicinity of the cathedral's eastern organ loft increases sensibility dramatically.